An Army Duck Shares His Passion: Duck Family Day! 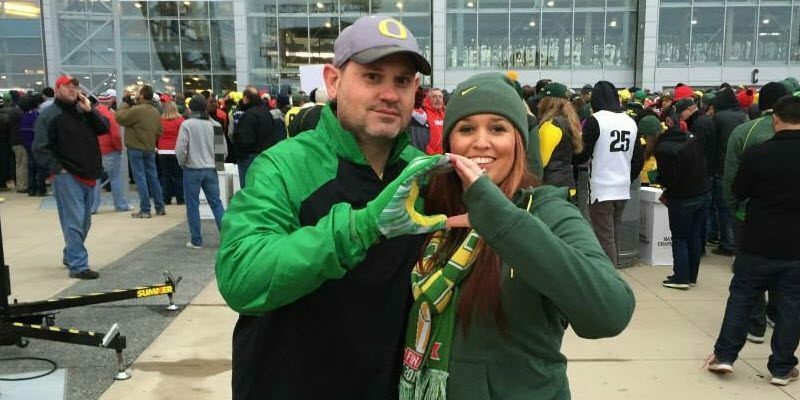 Duck Family Day is a new feature article where Oregon fans share their stories of … being Oregon fans! Email charles@fishduck.com to share your experiences, your family stories and what it means to be a Duck fan. Craig Harmon is in the military and a reader of FishDuck.com and is extremely passionate about our beloved Ducks, the same as you and me. Contact us and share! I grew up in a small farming town nestled between Eugene and Corvallis. All around me were “Beavers” and “Ducks” fans who always seemed to wear the appropriate colors but usually only on game days. I attended a handful of games through my childhood, but not until “The Pick” in 1994 did I become a fan. It was my junior year in high school and the only ticket I could afford was in a sea of purple. I had to sneak out of the section at the end of the game to avoid what I perceived to be physical harm. To this day that is the last game I have seen at Autzen Stadium. Although I had considered myself to be a fan, it wasn’t until 2001 that I really got into it. I was stationed in the mountains of North Georgia and was introduced to how SEC fans treated Saturdays in the fall. The fans in the South love football, maybe more than their own mothers. It was halftime of the Oregon game and I had decided to run to the local store to pick up a few adult beverages. I was proudly wearing my game day gear when an older man approached me. He asked where the hell Oregon was and if they even had a team. After a short conversation where I inadvertently disrespected the Georgia Bulldogs, I found myself running for my life as a man in his 70s chased me with his cane high in the air. After a short conversation, his son asked if I was a Duck or a Beaver. He handed me his business card and told me the next time I’m in Oregon to give him a call. Not long after that the Army moved my family and me north … way north. On our way to Alaska we stopped in Oregon to see family. I found the business card and made a call. Next thing I know Jerry Allen is giving me a tour of the complex, stadium, coach’s offices and the equipment room. I was able to meet head coach Mike Bellotti and who I still believe was Jonathon Stewart. Hook, line, and sinker … I was now without a doubt an Oregon Ducks fan and in my mind the biggest one there was. 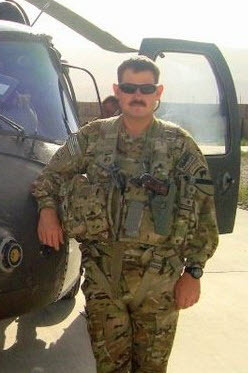 It was late 2005, and my unit had just deployed to Iraq. Back then there weren’t a lot of ways to talk with family or watch TV. I had to find a way to watch Oregon games, which would come early morning in our time zone. I found a fellow Oregon fan that had access to an AFN (Armed Forces Network) satellite and television set. We would meet up early, pull out our Oregon gear and watch the game like we were long lost buddies. During that deployment I also made a career decision. I decided to submit an application to attend flight school. I was selected and once again preparing to move back to the heart of SEC country. In 2006, I was stationed in Alabama while completing my flight training. Oregon was ranked No. 2 and Dennis Dixon was on his way to the first Heisman Trophy in school history. It was a Thursday; I was flying nights and had set the DVR to record the Arizona game. Due to some maintenance issues, I didn’t fly that night and was headed home during the first half. My son, who was six at the time, met me at the door in tears telling me how Dennis was hurt. My heart sank before I could get to the TV. It didn’t matter; I was a fan and spent the holidays wondering if I could make it to El Paso for the Bowl game. After flight school I once again was on the move; this time to Texas where college football is third only to the Cowboys and BBQ in the hierarchy of Texan pride. 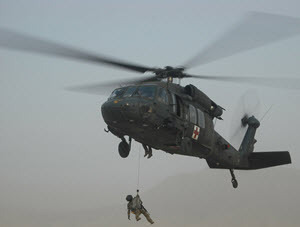 I was assigned to a MEDEVAC company and like many others, was on my back to Iraq. 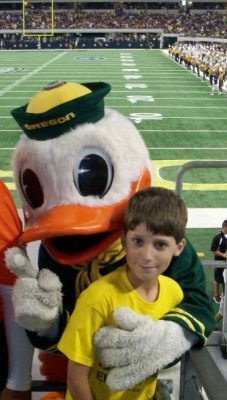 By this time everyone knew I was an Oregonian and by default I was a Duck fan, even if all the yellow and green didn’t give it away. Chip Kelly, Boise State, LaGarrett Blount – enough said. That afternoon my battalion commander approached me and asked if I was okay. Did I want to see the chaplain and talk about things? I must have had a puzzled look on my face; he told me he had watched the game and was concerned about my well-being. I had watched the Rose Bowl that year on a projector I acquired from our computer guys. The next day the battalion commander brought the chaplain to me. Gavynn Harmon with the Duck at LSU game. In 2011, we were getting ready for another year in Afghanistan. I packed all my military gear accordingly and made sure to save room for my Oregon gear. My wife and son purchased tickets to watch LSU and Oregon in Dallas. I finally got the AFN satellite tuned in the night before the game. There I was, at 4 a.m. local time, watching Oregon in Jerry’s World. That deployment would be challenging in many ways, but I always found myself in front of the TV or computer early every game day morning to watch the Ducks. During the Arizona game we received a MEDEVAC mission to pick up a patient and transfer them to a higher level of care. While flying the mission I was constantly asking for updates over the SATCOM radio. Thanks to me, everyone in Afghanistan knew the score of the game. It didn’t matter, I was happy. I have once again been reassigned to Alabama to suffer the SEC syndrome. My wife and I were fortunate to attend the National Championship game last year and have made plans to travel to all the Duck bowl games in the future. For me, one the advantages of the military life is the ability to converse with people from all over the country. In my office I have a Nebraska fan, Texas A&M fan, Georgia fan, and of course, I have to hear Roll Tide and War Eagle about 50 times during the day. I consider myself an Oregonian despite not having lived there in more than 18 years. I’m a Duck fan, a proud Duck fan. If the Ducks were to lose every game next year I would still be a fan. A sad fan, but once again, a proud fan.